I have been relatively fortunate in my birding life in that I don’t have a single nemesis bird that has vexed me. Sure, I didn’t like it in 2007 when I was doing a (not very) big year in New York and Black-backed Woodpecker would not cooperate for me. But I had seen one in 2006 and I have since seen them twice more so the species never rose to the level of nemesis bird for me. I mean, sure, I’ve had my share of dips but none of them were multiple attempts at a single species that did not end up in victory within three attempts. Instead of having a single arch enemy like Joker is to Batman or Baby Gerald is to Maggie Simpson I have several species that are approaching nemesis bird status. Below I share my five nemesis birds to be. I must see them before they achieve full nemesis status, just like I did with Black Guillemot. I think that definition works but I think that there is a bit more to it. A nemesis bird is frustration. A nemesis bird is anger. A nemesis bird is what makes listing more than just checking boxes on a checklist. A nemesis bird gives meaning to a birder. And when a nemesis bird is seen, well, maybe it would be better if your binoculars were lashed to the beast and it dragged you down to the watery deeps. Because what do you do once you have seen a nemesis bird? What will give your birding meaning? But I don’t intend to let things get that far. No, I will persevere and see each of these birds at my next opportunity. Otherwise, they will become true nemesis birds. Scissor-tailed Flycatcher – I haven’t made a ton of effort to find one of these. But I did chase one back in 2009 that I dipped on. The next one that appeared was out on Long Island when I was in Cape May. I have been in Honduras in winter, when the birds should be there, and never found one. Ditto for Costa Rica. I have never stumbled across one in all my time birding. This is a gaping hole on my life list that must be filled. If I make one more dedicated twitch after a Scissor-tailed Flycatcher and fail to find it this will be a nemesis for sure! Resplendant Quetzal – Sure, I have only had two real attempts at Resplendant Quetzal. The first, back in 2009, was when I was in Honduras. The one day we were to get into habitat for the bird there was a mudslide blocking the road and I never even got to the proper elevation. The second, on my recent trip to Costa Rica, came at the wrong time of year to pin down quetzals for sure, at least in the part of the country I was in. We still tried to find them and failed miserably, though we did find quite a few other species on likely-looking, fruiting trees. This bird is approaching nemesis status both because of the failures to see and because it is such an outstanding and amazing bird to see. 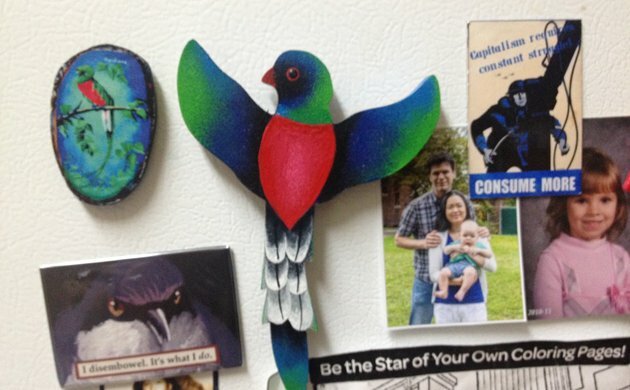 I console myself after missing quetzals by buying magnets. American Dipper – Yes, I have seen Brown Dipper in Kazakhstan and White-capped Dippers in Ecuador but somehow I am missing the only dipper found in the United States, the American Dipper. I have looked for them in southern California in winter several times, I have looked for them in Washington in summer, and I have looked for them in Costa Rica this month. But I haven’t found them. It might make sense linguistically to regularly dip on dippers but that is small consolation to this birder who is American Dipper-less. 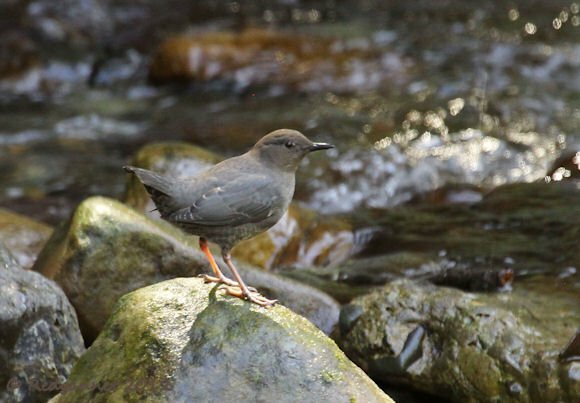 This is an American Dipper by Redgannet, who probably wonders what the big deal is. Whimbrel (in Queens) – I have actually seen lots of Whimbrel. Just in New York State I have seen eight different Whimbrel. But I have never managed to see one in my home borough of Queens despite there being at least twenty-one different sightings of Whimbrel since I moved here in 2008. It is absurd that I have seen Ruff, Curlew Sandpiper, Red-necked Stint, Sharp-tailed Sandpiper, and Upland Sandpiper, to name a few of the better shorebirds I have spotted in Queens, and not seen a Whimbrel. If I don’t manage one in Queens in 2015 then Whimbrel will be a nemesis bird for sure. 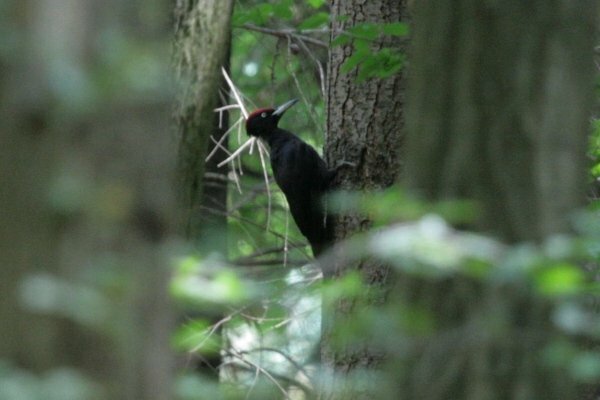 Black Woodpecker – This is a bird that has eluded me on two trips to Germany – both of which included exploring forests where they were supposed to be present – and a trip to a region of Hungary where they are supposed to be common. In Hungary I managed to track down White-backed Woodpecker, allegedly a much more difficult bird to see, but never spotted a Black Woodpecker. My lack of a Black Woodpecker has brought Jochen a vast amount of amusement (That’s one of his images at the top of this post.) and now Dragan is getting in on the act as well. This bird, I think, has actually already reached nemesis bird status. No, make that Nemesis Bird status, in capitals, as I really, really, really want to see one. Whenever I get to Europe again this will be my most-wanted bird. And if I dip again…well, that doesn’t even bear thinking about. I better not miss this bird again. Your list is clearly incomplete. Every day, in every way, you fail to see albatrosses. Yes. Albatross (and penguin too)…though I have never really made the attempt to see them. The Masked Duck has become such a nemesis of mine that I am tempted to refuse to see it even if it shows up. Take that Zorro Duck! Or, maybe I should try to give it the finger in Florida during next year’s Space Coast Festival. Wait, Pat, you’re coming to Space Coast? It looks like I might be able to but I meant the one in 2016, and sadly, not the one in a few weeks. Mine is Northern Shrike. This has become utter nonsense, considering that I’ve been driving grassland habitat every few days to the point of being able to pick up the few rarities that have shown up there recently. I even drove to different grassland/farmland habitat yesterday and still not a single one. I hope when I finally catch sight of one that it is in the process of murdering something. The best field mark on my first Northern Shrike was that it was carrying half of a rodent in its bill. That was awesome. Go to Yellowstone in winter to see American Dippers, and enjoy a magic time! I don’t have a nemesis bird, but am frustrated in trying to got to see the first Long-billed Dowitcher in Australia by being overseas, the holiday season and now the weather – 40C forecast for the area in the coming few days! Hey,Corey! Come to Texas anytime from April through November to catch up with those Scissor-tails. And just about anywhere, too. The fringes of metroplexes, all highways, and of course the ‘Grand Prair-ees’…They were on my list of birds-most-wanted since I was a little Virginia girl memorizing my Golden Guide. Decades later…Bingo! Look for scissor tailed flycatcher on my web site! I can show you where to find them for sure !! I found a spot in C Rica where you can see them 100% but it has to be in Late November! Hi Corey – I’ve seen Snowy Owls, but never in Cochrane District, Ontario where we are now. It is quickly becoming my county Nemesis. May 2015 bring a Nemesis Bird to us. I would have said Northern Shrike until 2013 when on fell in my lap without any effort on my part. For me I find that after 30 seasons I have not found Elf Owls despite several attempts (always seem to miss their migration season). As the last species deemed “abundant” in New Mexico not yet on my list I have to admit vexation. Residing in Germany, my nemesis bird is Wryneck. Just ticked my first Great Grey (Northern) Shrike last week, and 2 observed Corn Crake this past summer. Black Woodpecker are sometimes available in the local oak forest and White-throated Dipper up the road along the Tauber River. Painted Bunting! I have gone to Arkansas in April (and got a STFL that you missed! ), Florida in the summer every year and many, many times to coastal South Carolina. I live in NC, if that helps. They’re, at the least, 1 1/2-2 hours away. Beginner birders have seen them. But I’ve never heard, seen, or gotten near a PABU. I’m trying to change that this year! Still seeking the Montezuma Quail . . .